The plot structure of Mamma Mia 2 is in many ways exactly like the plot structure of The Godfather Part II—though without the Shakespearean tragedy and calculated murders. What I mean is that both movies balance an “origin story” of a major character in the previous film, a character who has died and looms large in legacy, with the present day story of that character’s child in some way filling their shoes or stepping into their footsteps. In The Godfather Part II, flashbacks to Vito Corleone’s life as an immigrant from Italian living in New York are countered with Michael Corleone's rise to power and isolation in 1950s Nevada. 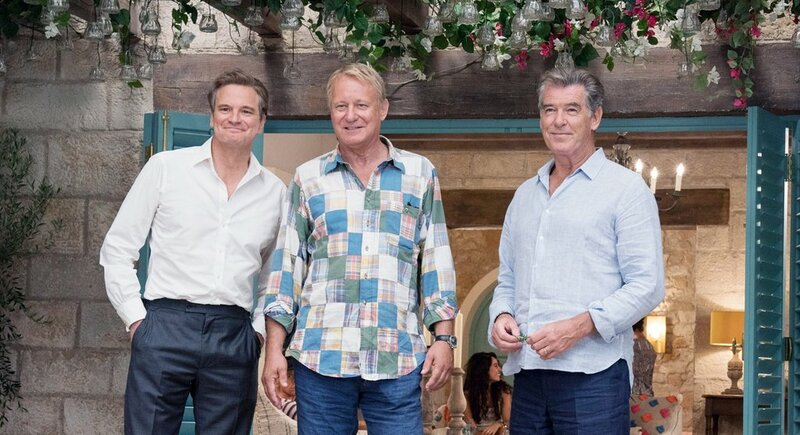 In Mamma Mia 2, flashbacks to Donna Sheridan’s travels and romantic encounters as a recent college graduate on her way to opening up a hotel on a Greek Island are balanced with her daughter Sophie’s present-day attempt to renovate her mother’s hotel and throw a party for the grand opening. I love The Godfather Part II. In fact, it might be my favorite movie of all time. Watching Michael Corleone’s accumulation of power and his slow descent into paranoia and complete and utter isolation from everyone he loves is perhaps the most riveting and heartbreaking character arc delivered on film. In Mamma Mia 2, the main plot point is that Sophie Sheridan wants to throw a party, there’s a storm, and she’s worried that some people might not show up. 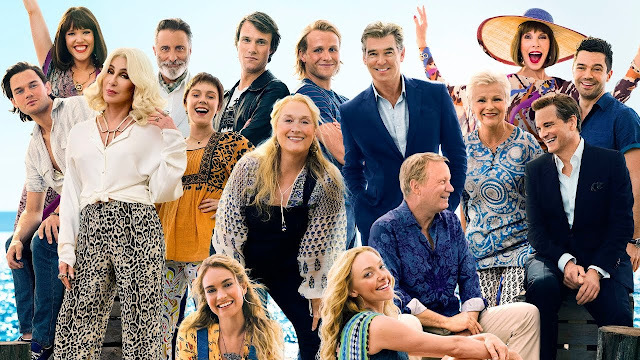 However, Mamma Mia 2 is perhaps just as good of a film as The Godfather Part II—if we judge it in its own right. I saw Mamma Mia 2 on a rainy evening in early August. I was exhausted both mentally and emotionally from work. I went into the movie with no expectations. In fact, I had no recollection of what even happened in the first Mama Mia even though I’d seen it, or parts of it, several different times on cable. My girlfriend and I had decided to see Mamma Mia 2 instead of the critically acclaimed Eighth Grade because we wanted a movie that would just be fun. As soon as the movie started, we realized that we were sitting behind two boys who were there own their own. The boys were each maybe 12 years old. One of them talked through nearly every scene—and he was hilarious! He questioned every plot hole, complained about every Abba song that the cast performed a choreographed dance to, explained to his friend what a cameo was by using Stan Lee’s cameos in the Marvel movies as an example. At one point in the movie, a fringe character jumps into the ocean wearing a wedding dress and he said, “There’s no way you jump into the water in a dress like that and don’t die.” I’m not exaggerating when I say that the entire theater broke out into hysterical laughter. There was something genius about this kid. But I watched as slowly, the audience turned on him. He talked too much, tried to make too many jokes. The whole atmosphere of the theater turned. Even my girlfriend, who had been laughing as much as anyone began to shake her head in irritation. Under my breath I muttered, “Pace yourself, kid. Know your audience,” as if I was some kind of comedy manager. I remained on his side even as a woman sitting in front of him told him to be quiet. And he persisted. Eventually, he won some of the audience back, while the rest just started to ignore him. When the movie ended, he and his friend tried to run out of the theater so no one would see them, but one of them dropped their raincoat and they stumbled trying to awkwardly pick it up before they bolted through the aisle and out of the theater. The movie itself was so ridiculous that you could only marvel at the fact that it was even made. Because the first Mamma Mia had featured all the top shelf Abba tracks, the sequel had to dig into the deep tracks. But who can resist an on the nose scene on Donna’s graduation day set to “When I Kissed the Teacher”? And who cares if they brought back lip-synced versions of “Waterloo,” “Dancing Queen,” and “Mamma Mia”? We should all probably listen to those songs every day. Have you listened to some of the chord changes in “Dancing Queen” lately? They are so strange for a song that achieves what it achieves. There’s a scene where Stellan Skarsgård’s character, Bill Anderson, is reintroduced that starts with a bizarre sight gag. Bill is at a sailing award dinner of some kind and he looks noticeably fatter. You can tell that Skarsgård is wearing a really bad fat suit and face makeup. First you wonder why the movie is even bothering to show that he’s aged so poorly and become obese. Then, its revealed that Bill has sent his brother Kurt to the award dinner in his place because he has to go to Greece to attend the opening of his “daughter” Sophie’s hotel. The scene ends with Kurt, Bill’s brother, starting to tell a story about a goat to the audience at the sailing award dinner. It doesn’t make any sense! The movie also features a recurring character called Alexio who appears in both the flashback scenes to young Donna’s adventures as well in the present day. In each timeline, the actor who plays Alexio is visibly acting so hard that it made me sincerely wish that I had gone to acting school, struggled to get parts in ads as well as single line speaking parts in sitcoms or dramas, then have my work dry up so I contemplate killing myself or quitting the business, but then get a lucky break to land an audition for the part of Alexio in Mamma Mia 2 just so I could have landed that role and tried to play it the same way the actors did in each timeline. One of the better recurring jokes in Mamma Mia 2 is about a ferry toll booth attendee who is obsessed with people’s hairlines! I am not making that up–it’s actually a bit and it works phenomenally! The fact that the character is so committed to that point-of-view (commenting with deep discernment on the hairlines of both men and women) is so unexpected and the jokes come at exactly the right times. The final sing-a-long to “Super Trouper” is a tour de force. This is mainly because “Super Trouper” is Abba’s best song. When you hear Frida Lyngstad sing, “I was sick and tired of everything / When I called you last night from Glasgow,” elongating “Glasgow” so that it becomes “Glaahasgow” and sounds so incredibly melancholy, you want to lie down immediately wherever you are and think about something you lost or something that feels so far away from you. Then, once ABBA layer in the “Soup-pa-pas” and “Troup-pa-pas” you curse them for being so trite, but also so diabolically genius in their understanding of pop. And in Mamma Mia 2 this song plays while the entire cast dances and sings along. All of the actors who play young versions of the characters in the 1979 timeline dance alongside the actors who play the older versions of the same characters in the present day timeline. Pierce Brosnan overacts and air mics his way through “Soup-pa-pas” and “Troup-pa-pas” alongside his younger self. In an odd way, its moving: time can age you, but with a song you can still exist alongside a younger version of yourself, a version who was maybe less risk averse, who made bad decisions, who more freely expressed how he felt, and who followed his heart too frequently but left himself more open to being hurt than he ever would now. Oh, and both Meryl Streep and "The Most Interesting Man in the World" guy from the Dos Equis commercials both make a cameo—that’s what the funny kid in front of me was explaining to his friend. After the movie, my girlfriend and I left the theater and walked out into the quiet, damp, and humid night. It was almost 11 o’clock. We went to a nearby restaurant to have a burger and a drink. I was tired, but in a great mood. I had forgotten whatever it was that was bothering me before I had seen Mamma Mia 2. Or, if I hadn’t forgotten, I certainly didn’t care anymore—the movie made it all seem so much more manageable. But The Godfather Part II has never made me feel the way I did after watching Mamma Mia 2.